Wanna podcast but don’t know how to start? Podcasting is a powerful marketing tool. When planned correctly, podcasting can generate revenue, attract new clients, grow your community, and position yourself as an influencer. How can podcasting help me build influence, grow my brand, expand my community and make me money? What equipment do I need to start a podcast? What podcast format is right for me? Our Podcast 101 Workshop experts are here to answer your questions about launching a podcast! 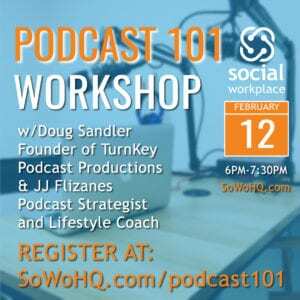 REGISTRATION INCLUDES 1 HOUR PODCAST RECORDING STUDIO CREDIT AT SOCIAL WORKPLACE! THIS EVENT WILL SELL OUT SO REGISTER EARLY!